I hope your eyes aren't crossing too much to read my overly proud post! This is my stunning Kaffghan (no modesty here) -- named for the designer of this 2nd Rowan KAL and one of my knitting idols, Kaffe Fassett. Now, to be fair, he and I are loosely collaborating on this, as I've gone rogue on his design. I talked all about my approach in this post, but the original design is a fabulous mash of colors matched in his classic highly explosive fashion. Here is a montage of some of the wonderful Kaffghans that have been posted in the Show-off Rowan KAL thread on Ravelry, to give you a taste of the original design. It came in 4 different colorways, brown, turqouise, red and pastel. Some people, naturally, added their own colorful touches! For all the authors of these wonderful versions, here is the thread filtered by photos only. You'll spy some Kaffushions in there, too! (Go ahead, say Kaffushions out loud, you won't be sorry). 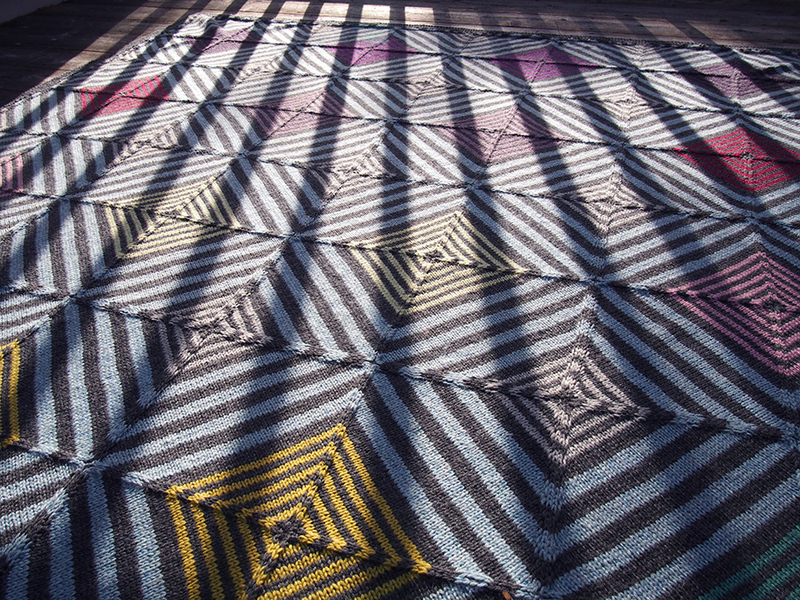 The afghan is created by knitting squares on the bias, to create a woozy diagonal stripe motif. 63 squares are then linked together for the afghan. It's knit using Rowan Pure Wool Worsted, a superwash yarn. I've used it to make quite a few things now, my Martin Storey KAL Afghan and my Laszlo Cardigan. I'd say it wears better in the blanket than the cardigan. It's really excellent stuff for a blanket. 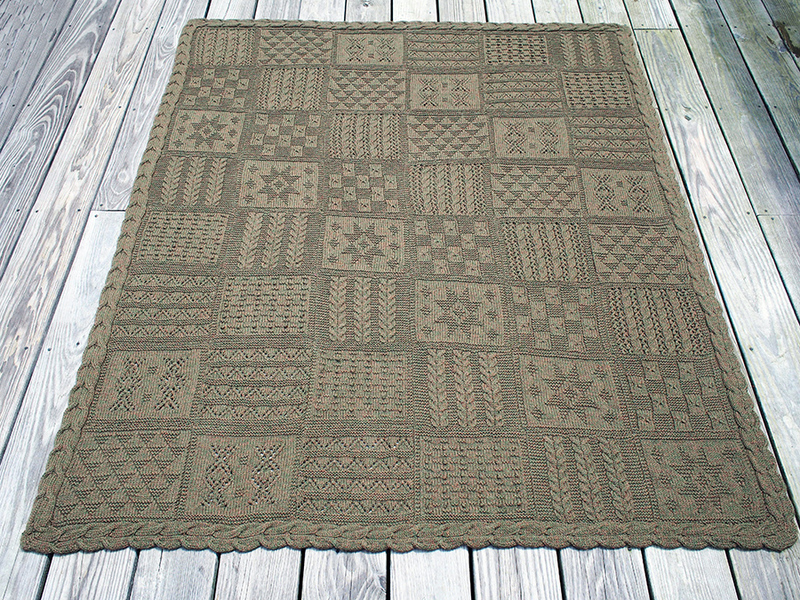 Download the free Martin Storey KAL afghan pattern, here. See my Laszlo Cardigan on Ravelry, here. And 63 is NOT divisible by 4! 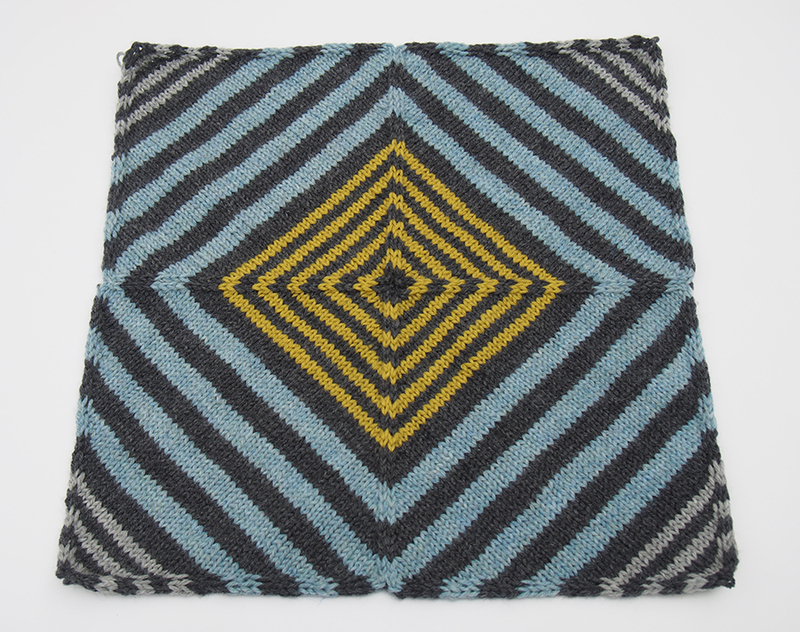 I wanted op-art symmetry in my afghan. SUPREME symmetry. 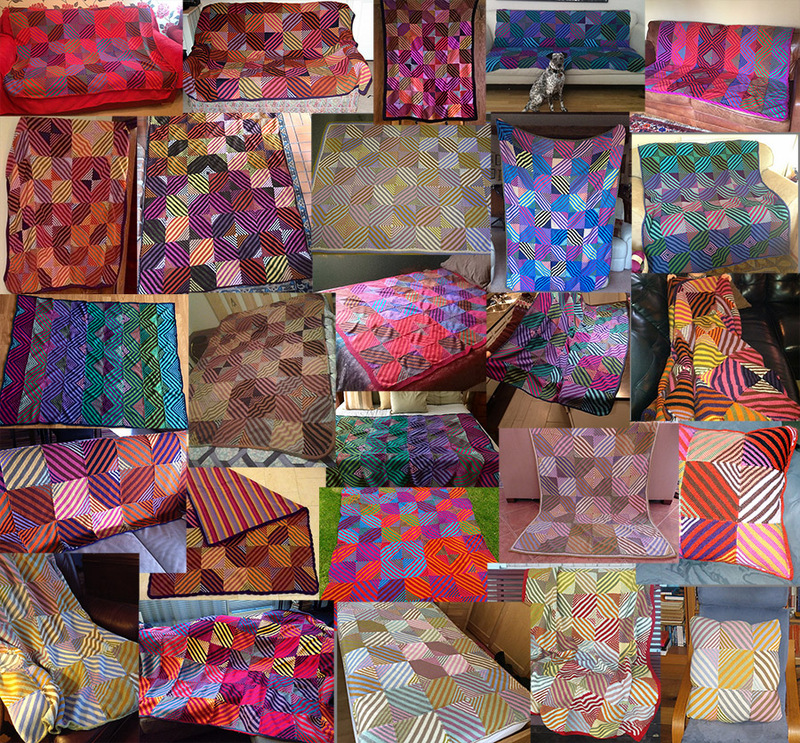 One choice was to make 64 squares, but who was ever comfortable lounging under a square? I needed one side longer, so it had to become a 10x8 afghan with 80 squares. 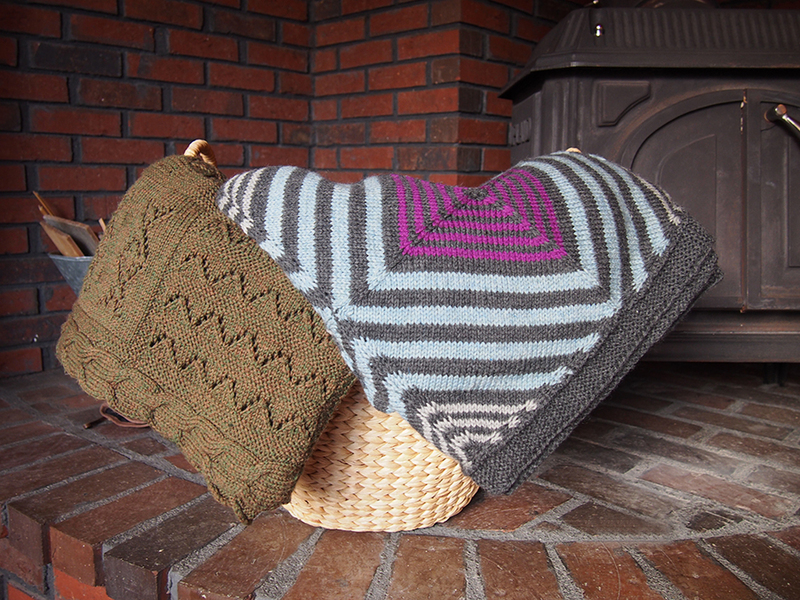 Yes, I knit 17 more of these little buggers -- but it was well worth it to see every foursome go cleanly to the edges. 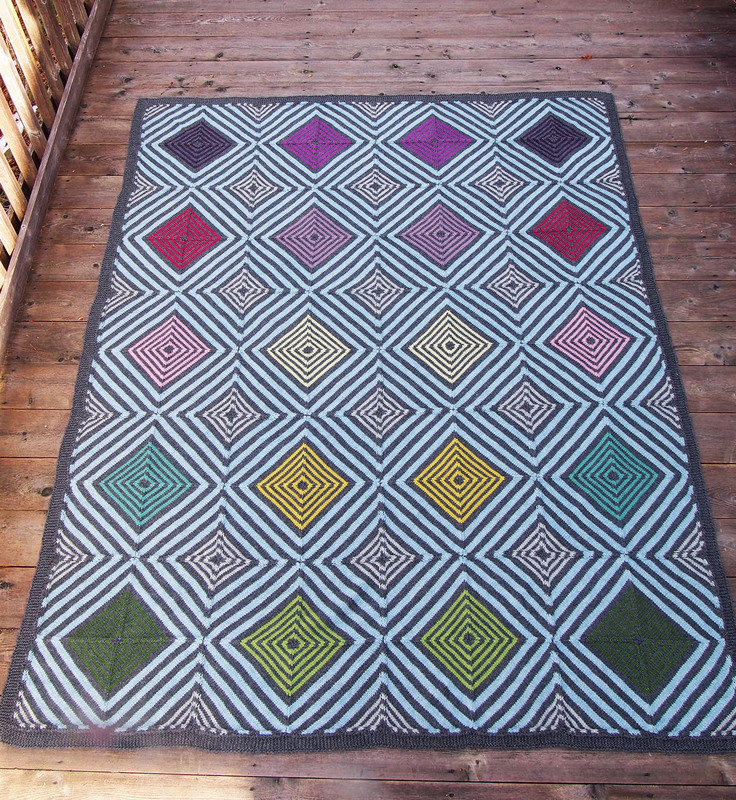 I had originally picked all of the colors myself, but then with the extra squares I needed a couple more shades to round it all out. That's where your knitting peeps come in! Despite my protests, everyone told me to keep the pastel pink and bring in an almost-fluo magenta. Couldn't be happier, good job girls. It's my first FO in Maine, you know. This means that it just has to be part of the decor, right? 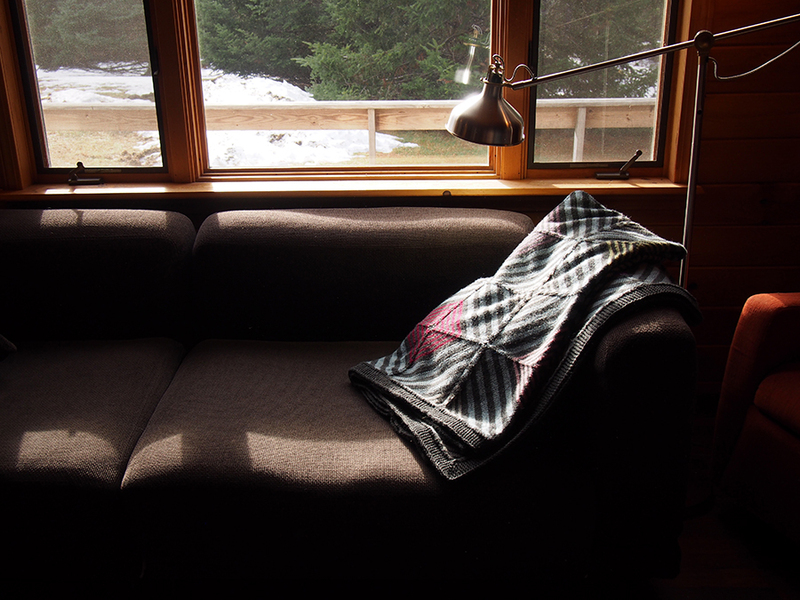 The truth is it will just be crinkled up on the couch, because I plan for this Kaffghan to be In Use At All Times. 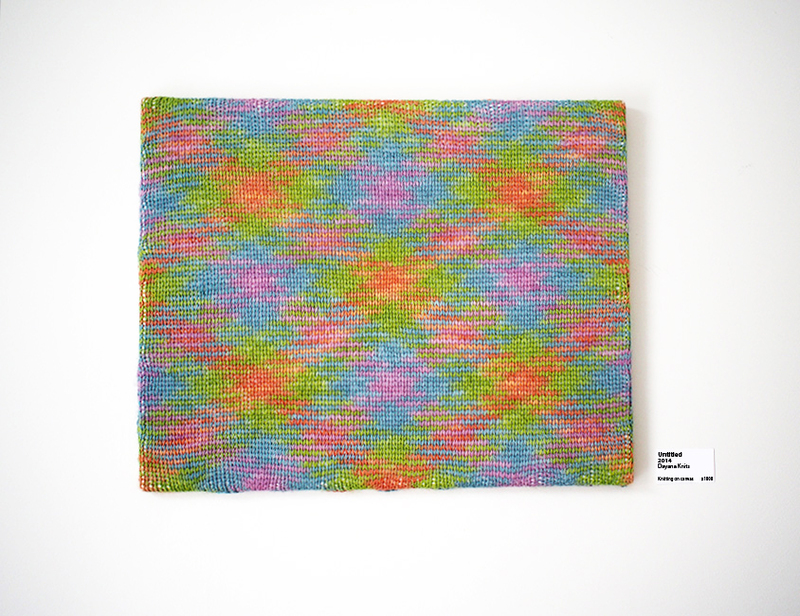 Some of you might have knitted all of your squares and are wondering what to do next. 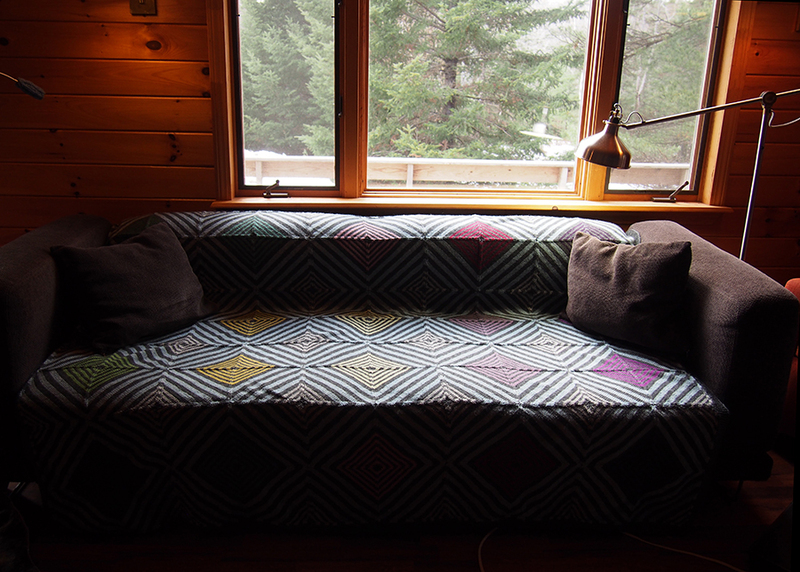 I sewed my squares together using mattress stitch, just like in the first Rowan KAL by Martin Storey, that post is here. 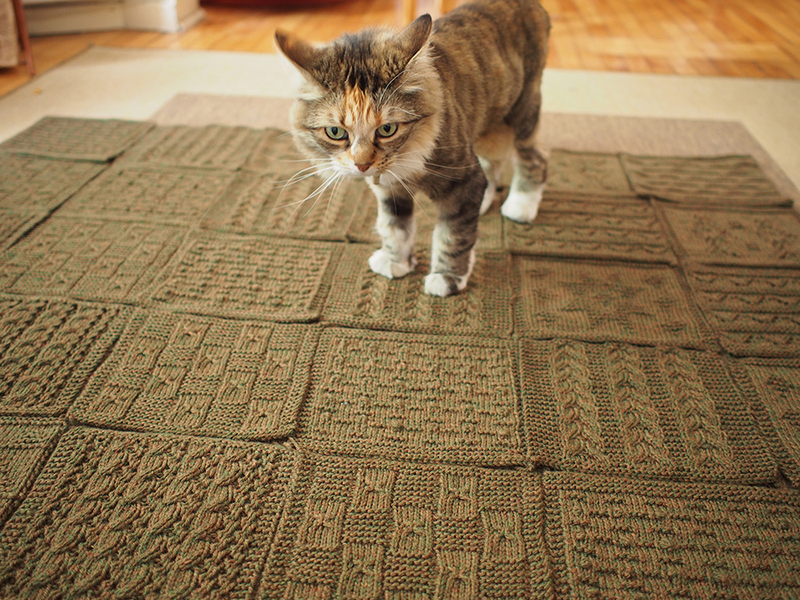 For that afghan, the border was knitted separately and sewn on later, a bit annoying. That post also details how to use short rows to turn corners in the cabled border. Imagine how pleased I was to see that the Kaffghan instructions used short rows to turn corners, too? Even better, the 7-stitch garter border included instructions on knitting it on as you go = NO SEWING. ***NOTE:*** The pattern says to link your border every 2 of 3 stitches. I found this to be way too tight. 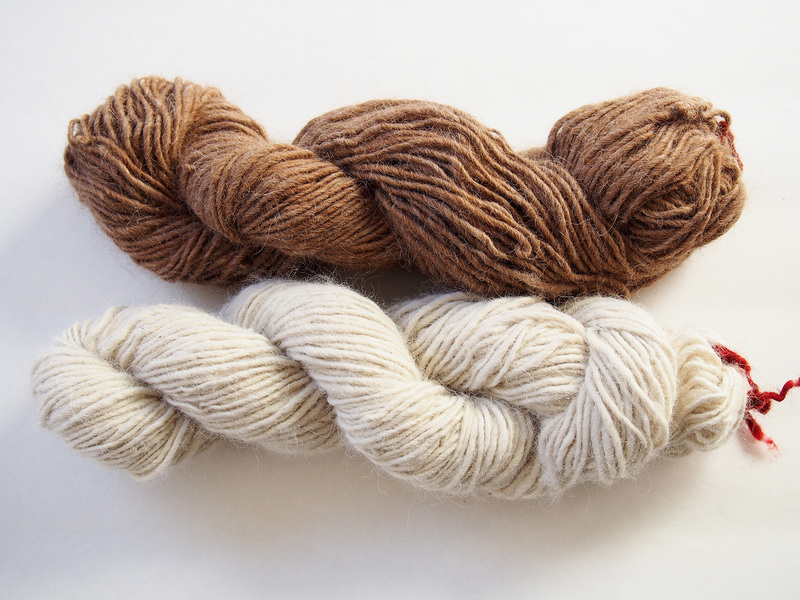 Go ahead and try different rates of attachment, 3 of 4, 4 of 5, etc, that will match with the drape of your knitting. I settled on 5 stitches out of 6 and am very pleased. I thought I would use more yarn, but I seem to still have only used 2 balls for the trim, even with the 80 squares instead of 63. And since I have been talking about the two afghan KALs, the other requirement is of course to have something beautiful to start piling these afghans into for storage. Now, I happen to know that Rowan is going to keep these fun KALs going -- but don't you fear, the next one is NOT an afghan!! 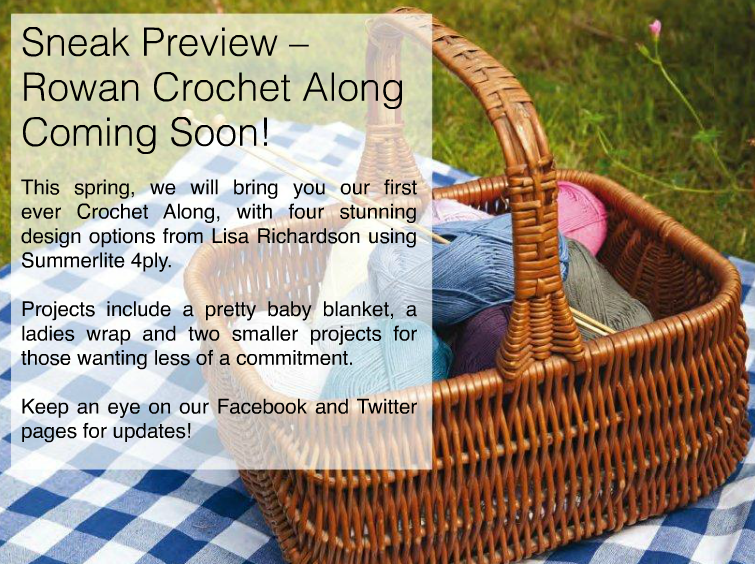 It will be a CAL actually (crochet), designed by Lisa Richardson using the new 100% Egyptian giza cotton yarn Rowan Summerlite 4-ply. 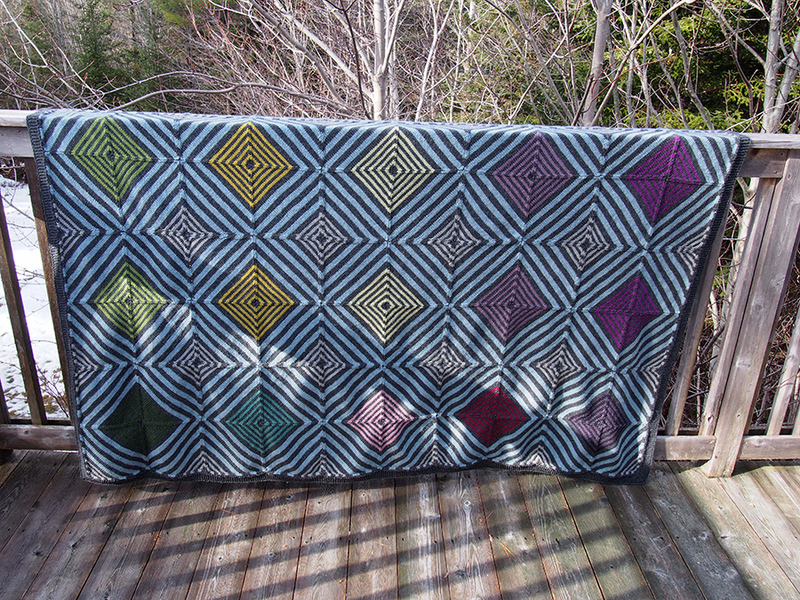 You can make a baby blanket, or a small/large ladies shawl/wrap. I just spied this ad in their newsletter this month. You can sign up for the newsletter here, by getting a free membership at knitrowan.com. And now for some house updates! (Go here for an intro to my house.) First off... 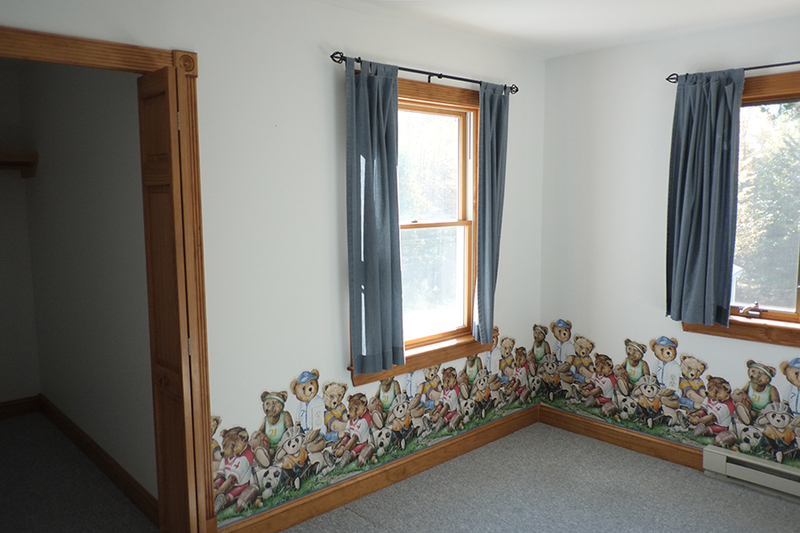 THE TEDDY BEARS HAVE BEEN BANISHED TO TEDDY BEAR HELL. Finally, our propane gas stove is being installed, amongst what must be real "swearing" by the sweetest Mainer gas man alive, "Ohhhhh, geez!" and "Ohhhhhh, Wowowowowow" and "Oh dear, what an unUSSSSSual construction!!!!!" I love how big the oven window is on this thing, by the way. And I really love the clean lines of this linear grate. 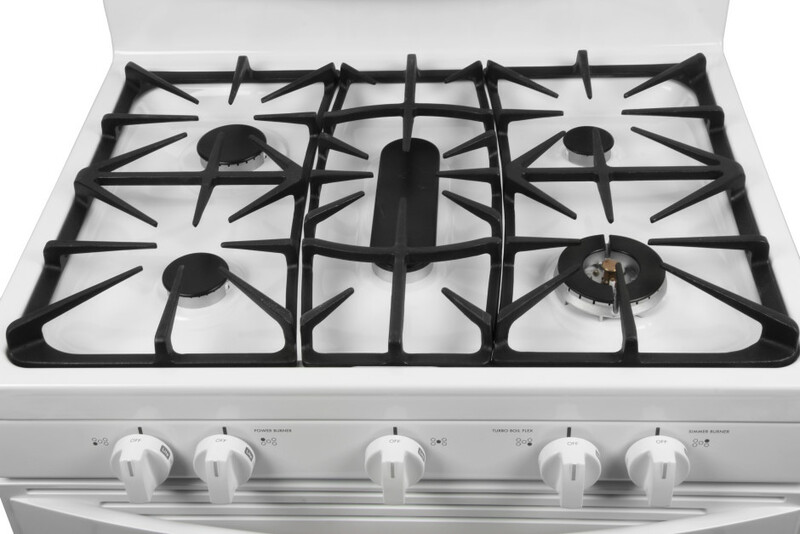 I absolutely despise all the spiny, dragon tongue, stuck-behind-a-Victorian-sewer-grate look of gas stove tops these days. But here's the real kicker. 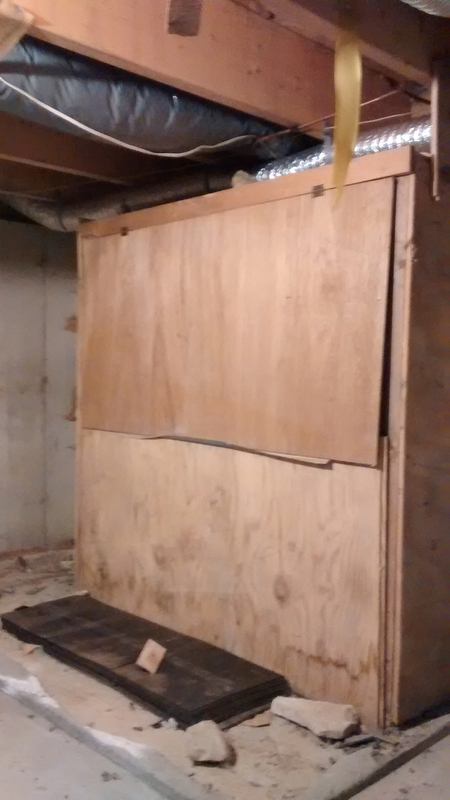 I had a basement guy come in because there is evidence of water penetration, and after the inspection he comes up and says, "You know, you have an interesting feature down there." 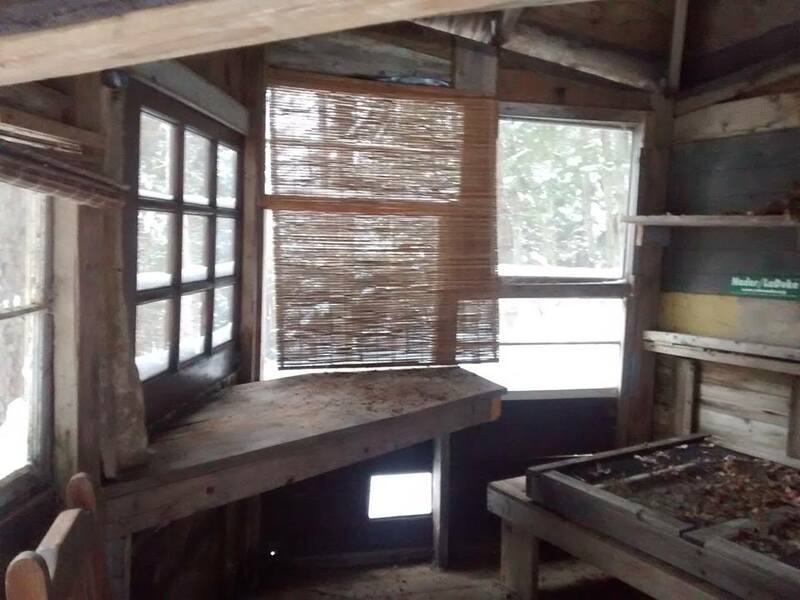 My mind ran over all sorts of weird things, mostly involving bugs or dead carcasses, but I never imagined he would say, "You have a marijuana growing box." OMG! At least 5 people opened that box, if not more... and it never occurred to any of us! 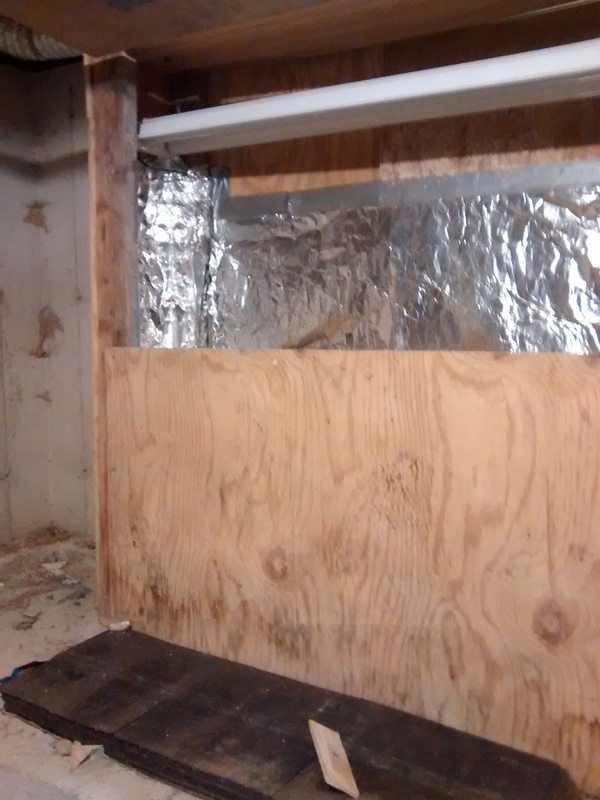 Yeah, it's a glorified plywood box with a fluo lamp above and lined with foil. HILARIOUS. ... the property was referred to as The Dark Continent. SPOOKY. 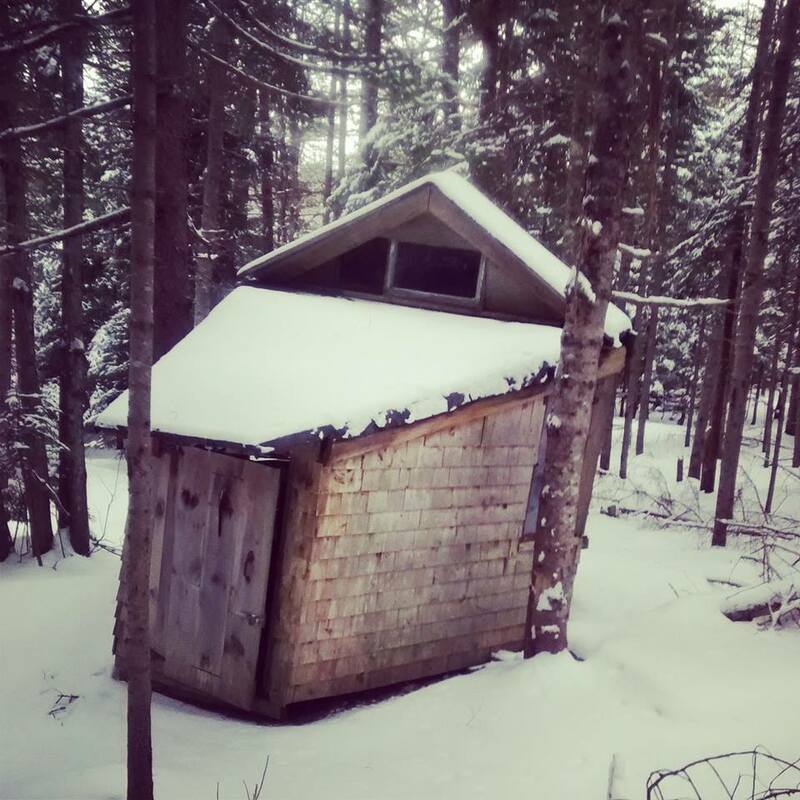 True to its name, there are little houses throughout the forest, including this one owned by The Blair Witch, a proud supporter of Ralph Nader. 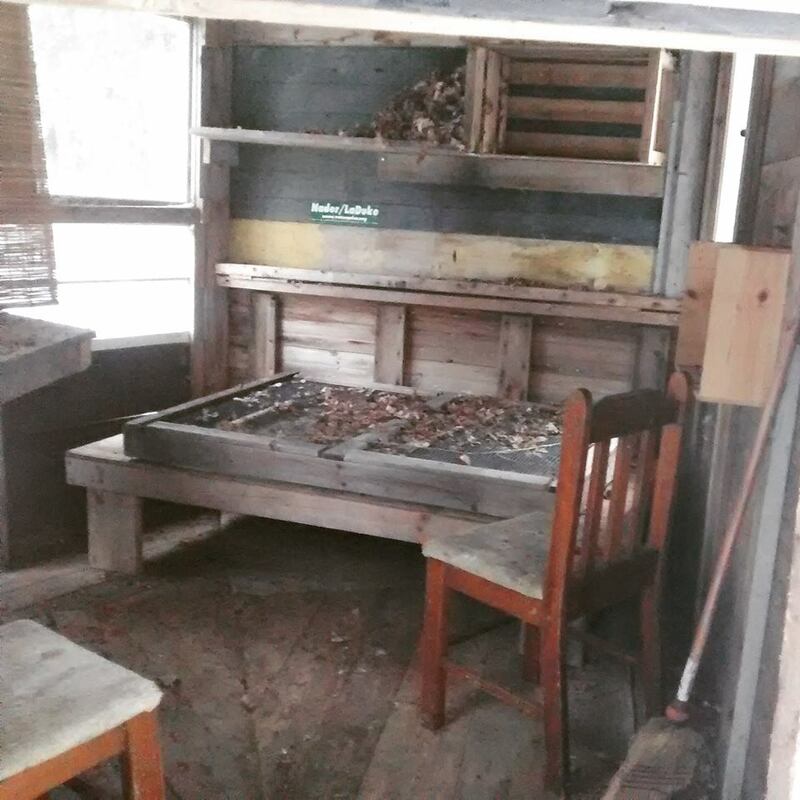 A desk to ghost write (literally) Stephen King novels. Fantastic blog as usual. You're certainly getting on quickly with changing your colour scheme, your choices are lovely. Thank you! Now I wish I had used that dark gray more, it's really awesome. 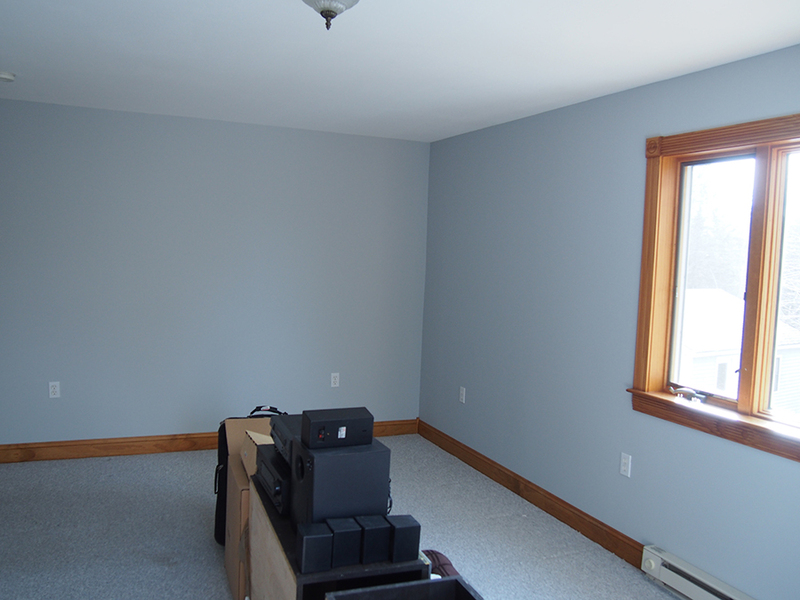 Of course, gray is in NOW, but in 10 years a buyer might be like, "oh that is SO 2010s". That kaffghan is absolutely stunning. I have been watching others' posting their finished objects, but yours is by far my favorite. If I ever got the gumption (and time) to make one, I'd want one exactly like yours. 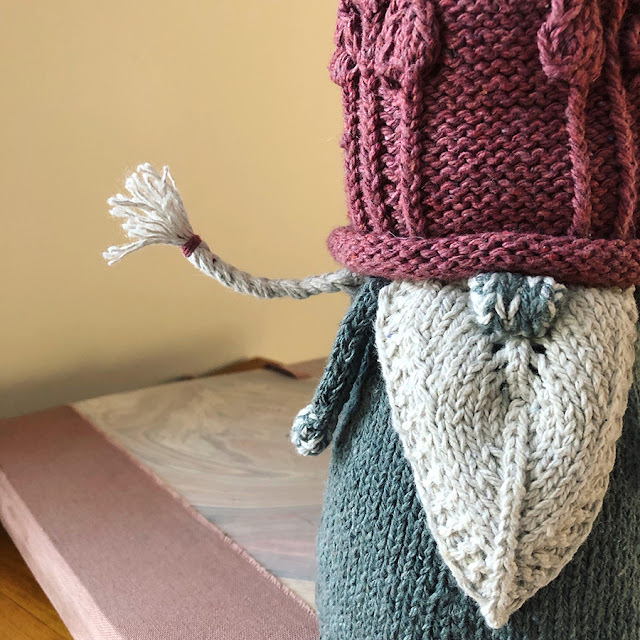 I'm so glad I stumbled across your blog - love seeing your home stories and watching your knitting projects. Thanks for visiting Lois! It might be hard to beat this home story, but I'll keep trying, lol. If you go to my Ravelry project page, you'll see all the colors I used. Copy away! Lucky you to settle is such a wonderful locale. Amazing Kaffghan. 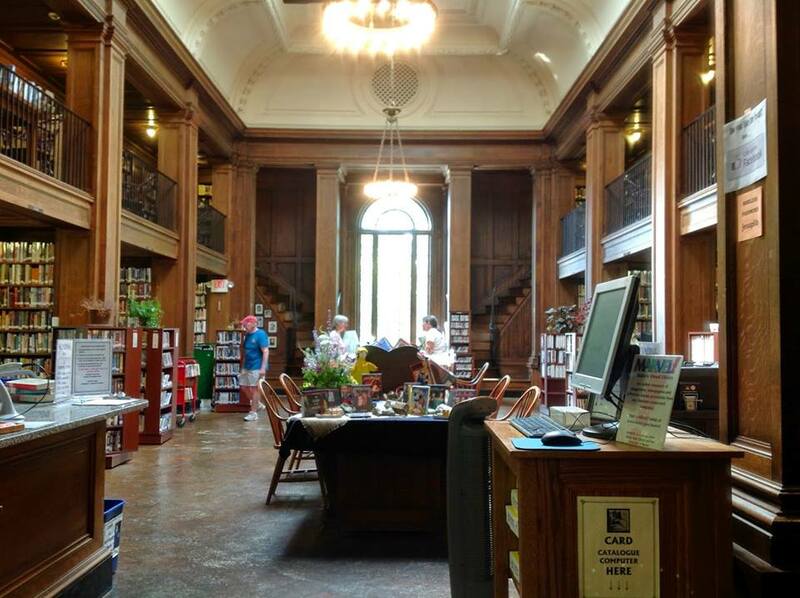 Pretty, pretty library. Thank you for sharing your photos! Oh, this was so much fun! You truly caught the Maine vibe! I absolutely LOVE how your afghan came out. The others are all beautiful too, but yours is just stunning. I've tried knitting and am in need of more practice, so I'm a crocheter for now. I'm excited about the Rowan Spring CAL. It looks like you are really settling in to the new house and getting to know some great people in your new area. Your work is very inspiring to me and I enjoy your blog and FB posts very much. Keep up the great work! Cheers! --Rita Z. in Alexandria, VA. Thanks for following Rita, I'm happy you like my posts! Now, it is funny you mention practicing because I am doing a CAL afghan right now to practice my crochet, from Scheepjeswol. http://www.ravelry.com/projects/dayana/scheepjes-cal-2014 That means that a KAL like this one can help you practice your knitting. Believe me, you'll be an expert at increasing and decreasing and tension after 63 of the same square. ;) See you in the new Rowan CAL, then, I'll be joining up too. 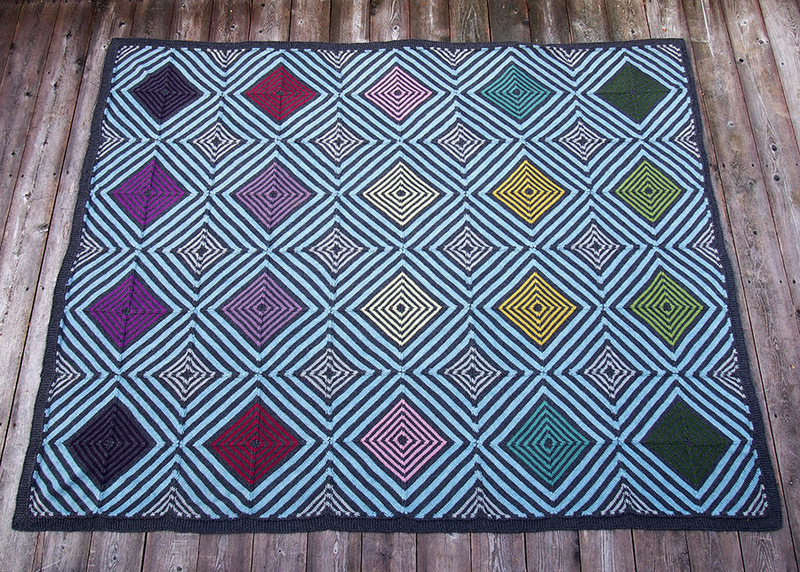 Love what you've done with the afghan (80 squares! it covers the couch!) 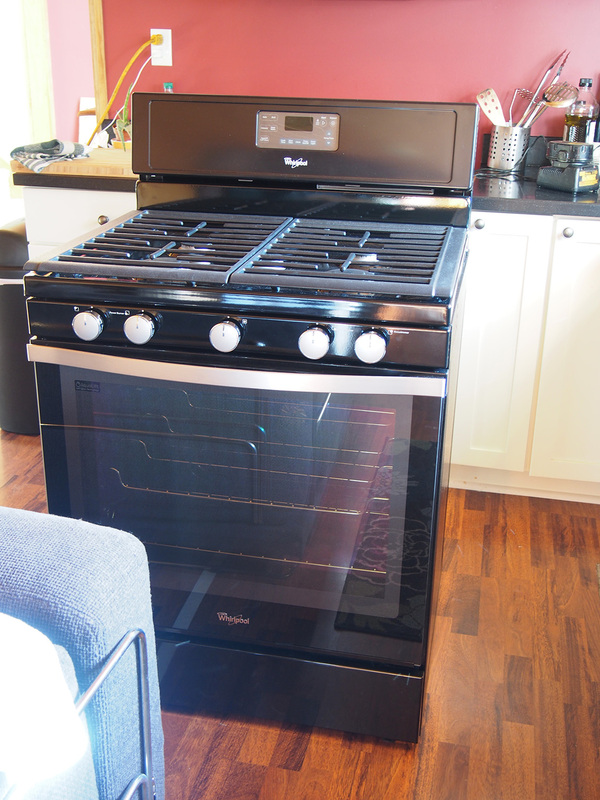 - and your interior painting - and the gas range with the chic grates. 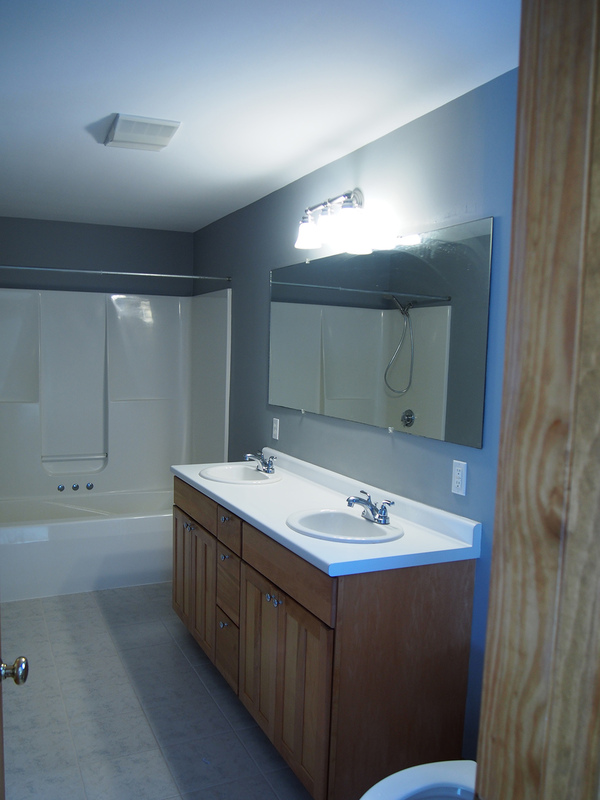 I'm enjoying redecorating vicariously: no need to suffer the hassles, just appreciate the handsome results! Well, I'm glad ONE of us is saving some cash, because it ain't me... YIKES! 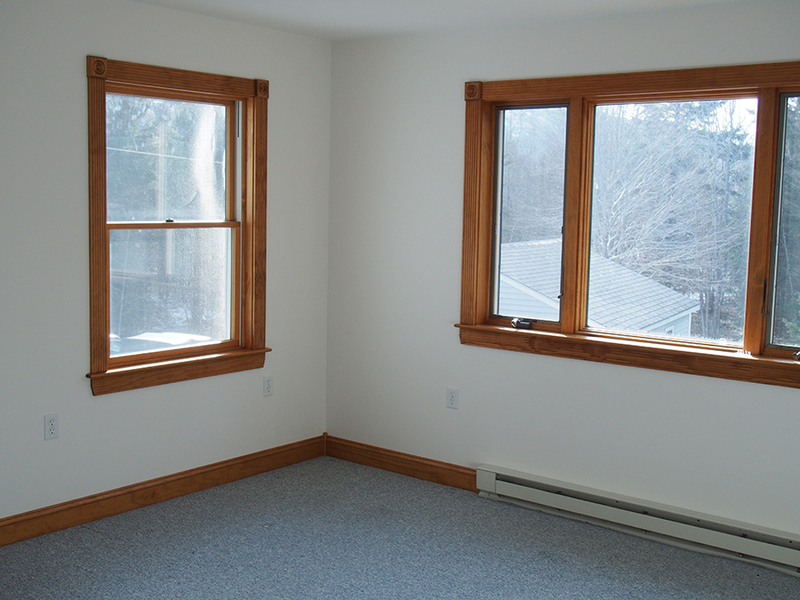 Next is the hardwood floor, an island and closet organization, that's going to totally bust the bank. Love your blogs which are always so interesting! Your afghan looks fabulous, just where do you get all your energy from! Loving what you are doing in your new home, looking forward to your next exploits. Thanks for sharing. 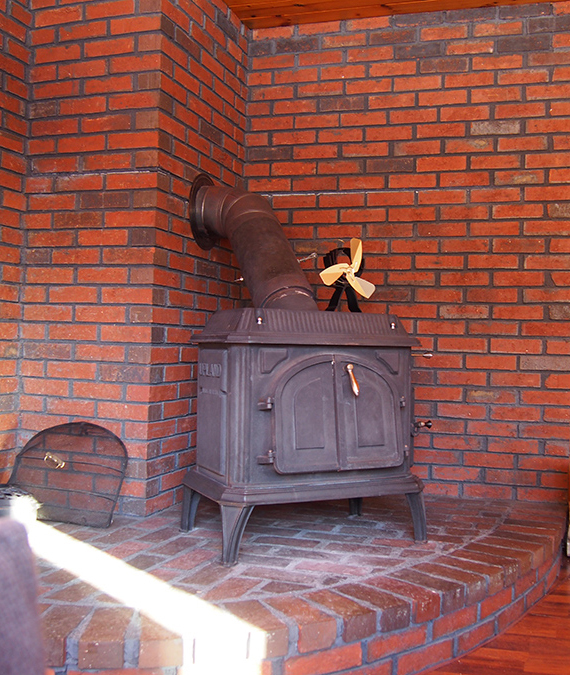 You have snuggled nicely into your new home! Wow, all those Kaffeghans, lovely! 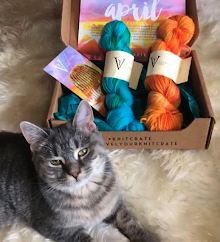 And what a very nice house warming gift--YARN!